Venezuela’s government is ordering the partial closure of its border with Colombia hours ahead of a U.S.-backed plan to deliver humanitarian aid over the objections of President Nicolas Maduro. Vice President Delcy Rodriguez said on Twitter that the government was ordering the temporary closure of three crossings in Tachira state because of the “serious and illegal threats” against Venezuela’s peace and sovereignty coming from Colombia’s government. Venezuela’s foreign minister says about 60 countries have backed its campaign to promote the U.N. Charter’s principles of non-interference in a nation’s internal affairs and opposition to threats to use force — and have come up with seven proposed initiatives and actions. One action under consideration is a proposed letter to Guterres which Venezuela circulated to 46 countries last week expressing “serious concerns” at what it called “threats to use force” against Venezuela in violation of the U.N. Charter. Arreaza said he expects “some news” next week after diplomats discuss the proposed initiatives with their governments. Venezuela’s foreign minister Jorge Arreaza is calling the opposition’s attempt to deliver aid on Saturday “a spectacle” and is accusing the United States of orchestrating the event “to generate violence” and get the military to rise up. “We can only hope that sanity and good sense will prevail in Cucuta, in Colombia, and that it will just remain as a big show, a big party, and that they don’t try to open the doors to a military intervention,” Arreaza told a news conference at U.N. headquarters in New York on Friday. “Our armed forces protect our national sovereignty and never will take action in a disproportionate manner against our people and citizens,” he said. Guaido spoke late Friday from Cucuta, Colombia, on the eve of efforts to bring emergency food and medicine to Venezuela’s neediest over the objections of President Nicolas Maduro. He says he and other lawmakers made the trip across Venezuela with the help of the country’s military, a key player needed to defeat Maduro. Venezuela’s foreign minister says the Maduro government is still in discussions with the United States on extending an agreement for U.S. diplomats to stay in Caracas. 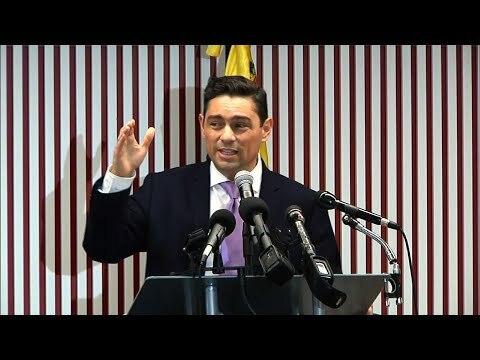 Jorge Arreaza told a press conference at U.N. headquarters in New York late Friday that there is a meeting pending with the U.S. envoy for Venezuela Elliott Abrams to “work out, flesh out” an agreement. He denied reports that an agreement has been reached. After the Trump administration recognized parliament chief Juan Guaido as the country’s legitimate leader last month, President Nicolas Maduro severed diplomatic relations with the U.S., ordered the expulsion of all American diplomats, and recalling Venezuelan diplomats from the United States. Arreaza said two preliminary meetings on the issue of the U.S. diplomats were held in New York, “and there may be a third one soon,” which he hopes will take place while he’s still in the city. Richard Branson took the stage and led a crowd of thousands in chanting “Freedom” and pumping their fists in the air to close the event. Guaido’s surprise appearance Friday at the star-studded “Live Aid Venezuela” concert attended by thousands of Venezuelans marks a new test of authority for President Nicolas Maduro. U.N. Secretary-General Antonio Guterres is strongly appealing for violence to be avoided on Saturday, which Venezuela’s opposition leader has set as a deadline to bring emergency food and medicine into the country. President Nicolas Maduro says humanitarian aid isn’t needed and has vowed to block attempts to bring it into Venezuela. “For our part, aid should be used in a way that is impartial and that is free of political or any military objectives,” he said. U.S. officials say the agreement will allow the diplomats to remain in Venezuela for another 30 days amid a battle over the legitimacy of Venezuelan President Nicolas Maduro. The Trump administration last month recognized parliament chief Juan Guaido as the country’s legitimate leader and demanded Maduro step down. In response, Maduro announced he was severing diplomatic relations with the U.S., expelling all American diplomats and recalling Venezuelan diplomats from the United States. Strumming her ukulele, Reymar Perdomo on Friday sang “I Left,” which has become the unofficial anthem of Venezuelans fleeing their country’s economic and political crisis. Perdomo was the first to take the stage at the Cucuta concert organized by British billionaire Richard Branson, who is trying to shed light on Venezuela’s humanitarian crisis. Perdomo said performing so close to the border where she herself crossed not long ago brought back difficult memories. She also said she’s confident there will be change because Venezuelans were showing they wanted it. The Trump administration says it’s sent nearly 200 metric tons of humanitarian assistance over the past two weeks to the Colombian-Venezuelan border for distribution inside Venezuela. The aid is part of a $20 million package the administration announced last month after it recognized National Assembly head Juan Guaido as Venezuela’s legitimate leader and demanded that President Nicolas Maduro step down. Branson said he postponed in California a planned test flight into space by his Virgin Galactic company to join dozens of pop artists from Latin America in the Colombian city of Cucuta for Friday’s concert. The U.S. and dozens of other countries recognize Guaido as Venezuela’s rightful president. “For those people who think Venezuela is a utopia and Venezuela isn’t suffering they should really come here into the crowd today and ask them why they are leaving,” Branson said at a press conference early Friday. Venezuela’s deputy foreign minister who is visiting Moscow says the embattled Venezuelan president is in persistent contact with Russia’s leader. Venezuelan Deputy Foreign Minister Ivan Gil said at a meeting in the upper chamber of the Russian parliament on Friday that President Nicolas Maduro is “constantly in touch” with President Vladimir Putin on the phone. He thanked Russia for a recent shipment of medicine but reiterated the government stance that there is no humanitarian crisis in the South American country. Venezuela’s government and the opposition are set for a showdown on Saturday as the opposition pledges to draw crowds to the country’s western border to try to usher in aid that Maduro has vowed not to accept. The joint envoy for refugee agency UNCHR and the International Organization for Migration, Eduardo Stein, praised the “tremendous solidarity” shown by Venezuela’s neighbors to people leaving the country. Deputy lawmaker Mariela Magallanes of the opposition-controlled National Assembly said Friday’s pre-dawn incident was a direct attack that left a backup driver injured. The caravan of buses was travelling overnight from Caracas to the Venezuelan border town of Urena, where opposition supporters are planning to collect international aid despite President Nicolas Maduro’s refusal to let it enter. She says it’s unclear who was responsible and the driver was being treated for injuries. Magallanes says the attack won’t stop the humanitarian aid from coming into Venezuela. Venezuela’s power struggle is set to become a battle of the bands on Friday. British billionaire Richard Branson is sponsoring a Live Aid-style concert featuring dozens of musicians including Latin rock star Juanes on one side of the border, while Maduro’s socialist government is promising a three-day festival deemed “Hands Off Venezuela” on the other. “The eyes of the world will be on Venezuela,” opposition leader David Smolansky said in advance of the concert.